I made a card today just for the fun of it!! And I had a blast!! Since the Christmas season is behind us now, I decided to make a Valentine card using Power Poppy's Good Thinking: Love Notes set. I hauled out my Minc Machine and went to work. This baby came together rather quickly and I think it turned out fabulous. I have to mention that I had some help though...I used today's Splitcoaststampers Sketch designed by Power Poppy's very own, Ally. You can find the sketch HERE. 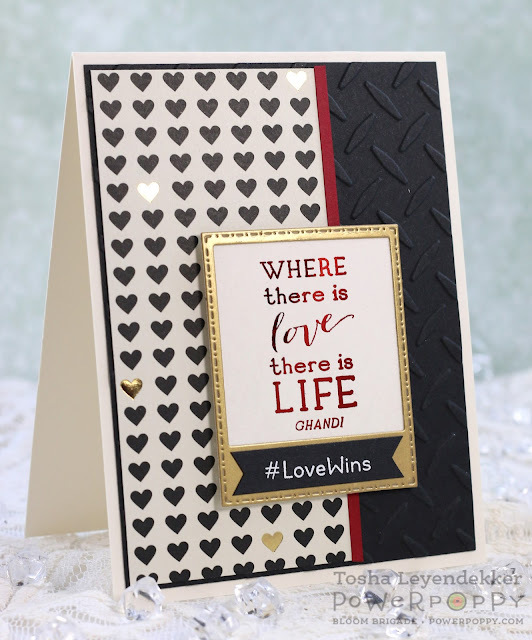 Both sentiments were foiled using the Minc Machine, and I used a Cuttlebug embossing folder for the black panel. 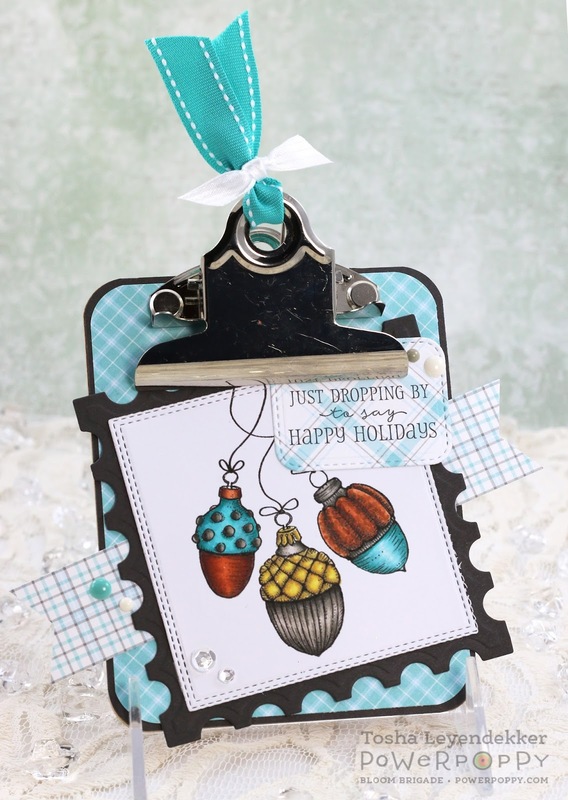 I love the sweet little Photo Frame die from Jillian Vance Designs. That's it. The sketch was an easy layout, which I thought was perfect for a masculine card. Thanks for dropping by!! I hope you are having a fabulous week! Hello creative friends!! It's been awhile!! Life has been busy as I'm sure many of yours has been also. 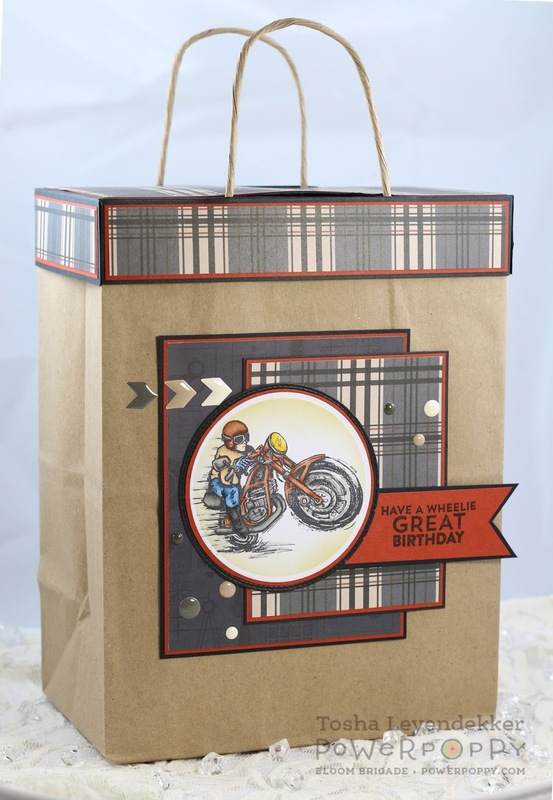 I'm excited to share a sweet Gift Bag I made for a dear friend of ours. Since his birthday is in the month of December, I thought it would be fun to make it none Christmas to separate it from the Holidays. I used Power Poppy's Move the Soul set for the gift bag front. It seems he and my husband think that one day they will each own a Harley and will take their adventures to the roads. Silly boys. Like that's ever going to happen. LOL But it's good to dream right?!?! My Gift Bag Topper tutorial can be found HERE. 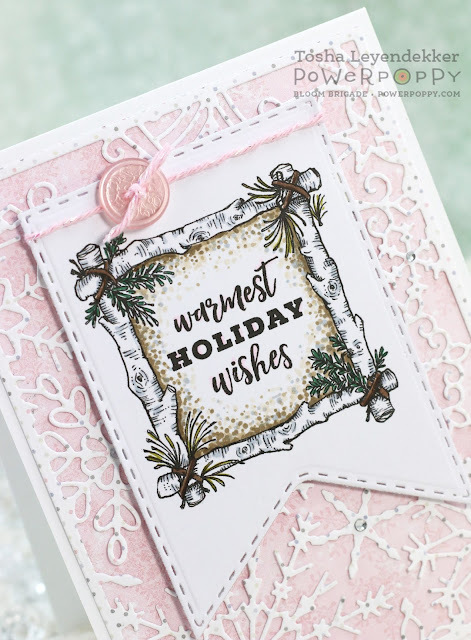 "The idea is to create something that will be a sweet treat for someone else (so think card, tag, hostess gift, etc) designed to help with those quick Christmas gifts." I hope you'll get a chance to participate!! That's it for today's project!! I hope you are all safe from crazy weather, and are enjoying all this year's Holiday festivities!! Hello fellow crafters!! I hope those of you from the states enjoyed a nice Thanksgiving. I am very blessed and am so thankful for my family, dear friends, and being able to do what I love...papercrafts. Thank you for visiting and for your kind comments. I am so grateful!! Being that it is the 25th, it is time for another digital release, and Marcella went all out!! That girl!! I tell ya! She has designed four charming wreaths with a variety of sentiments to include inside if you like. I chose to work with the Wreath: Birch and Evergreen, and to make the background pink since I'm still "Thinking Pink" for this month's Power Poppy Power and Spark Challenge. There is still time to participate too. 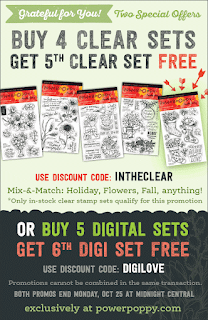 If you enter, you could win a free stamp set!! For a quick explanation about my card: The image was sized to fit into this banner die and colored with Copics. I used pointilism to fill the inside of the frame for bit of pop. 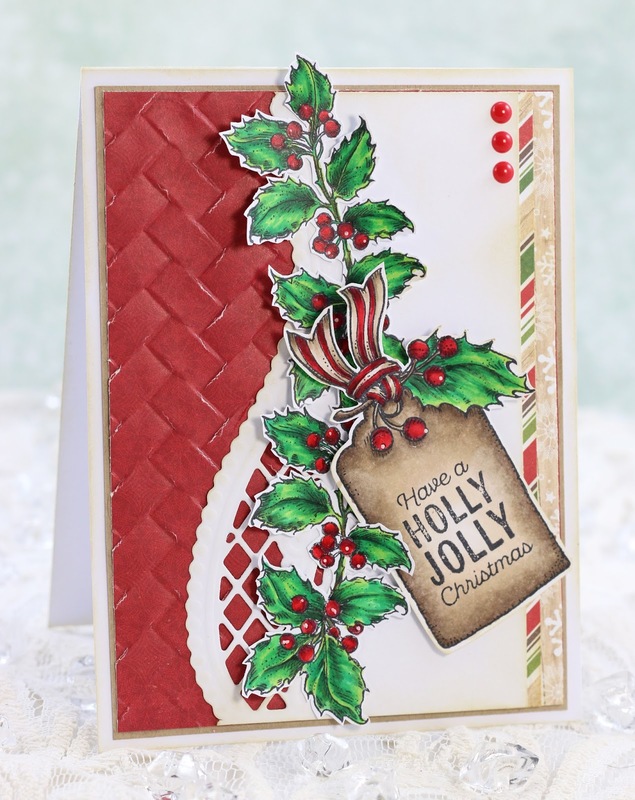 The background was diecut and layered over a pink piece of dp. And lastly, I added a bit of string and a sweet button to finish it off. Also, right now...TODAY!! Power Poppy is having a fabulous sale!! And I mean F-A-B-U-L-O-U-S!!! You really should head on over to the Power Poppy Blog for all the delicious details!! Marcy even has a sweet little surprise!! Don't you love surprises?!?!?! Is this incredible, or what!?!?!? That's it for me today, y'all!! Thank you so much for dropping by! I hope you enjoy a nice relaxing weekend!! Hello my creative friends!! Fall has finally arrived here in Central California, and I couldn't be more thrilled!!! Our trees are finally changing color, and the air is crisper. I thoroughly enjoyed a brisk 36 degree morning today while walking my dogs. Yes!!!! 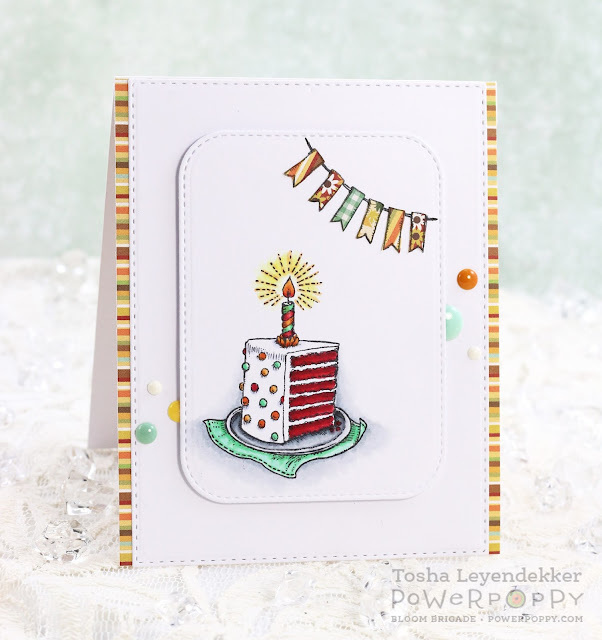 I have a special card to share with you today, using Power Poppy's Party Time set. You see, it's one of our illustrious leaders' birthday on Sunday, and her name happens to be....JULIE!! So, if you get a chance...hop on over to her blog and wish her a Happy Birthday! She most definitely deserves a very special day!! Since her birthday is during "my Fall"...I thought I'd incorporate Fall colors. The cake is colored with Copics, and I paper-pieced the banner using Cartabella's Autumn dp. That's about about sums up today's project. Now be sure to check out the following Bloom Brigaders for some more inspiration. 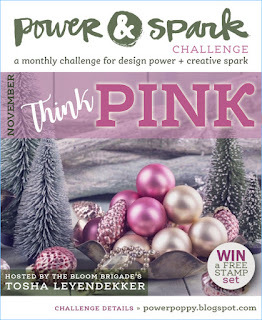 Remember, we're still "Thinking Pink" for this month's Power Poppy Power and Spark Challenge. We would love to see your Pink Christmas creation!! 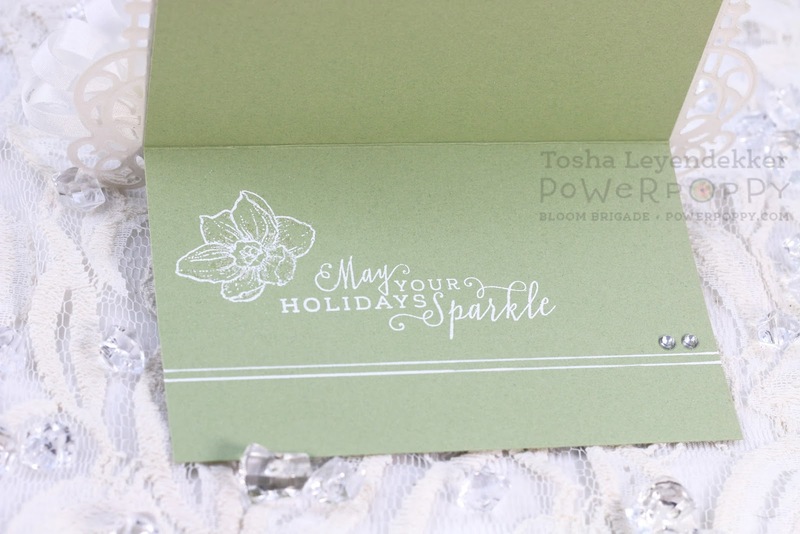 If you participate, you could win some free Power Poppy stamps!! Thank you so much for dropping by! I hope you get to enjoy a fabulous weekend!! Okay, some of you may be shocked!! 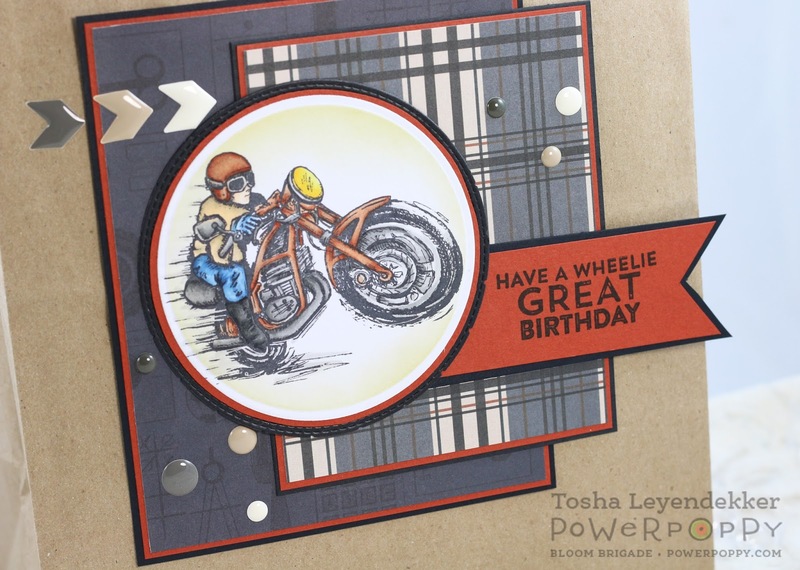 I'm posting a card two days in a row, and it's not even for a Clear Stamps set release. Crazy!! 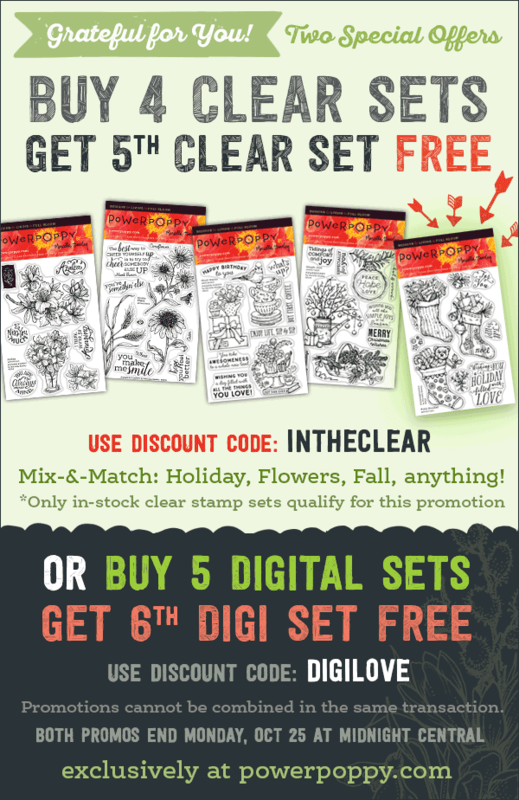 Since today is the 5th of November, Power Poppy has a new digital stamp set for y'all!! 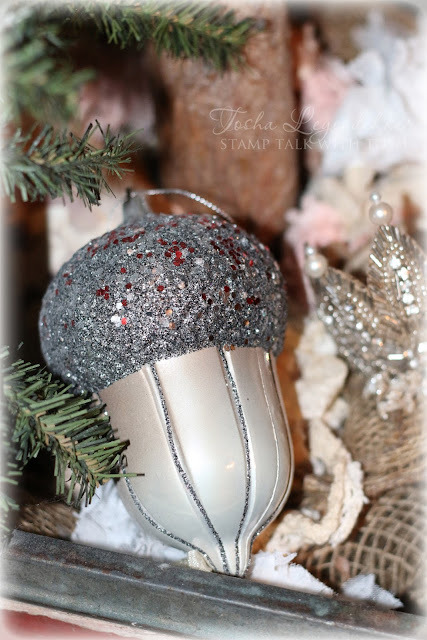 It's called Acorn Ornaments, and they are quite the vintage delight!! Now, I LOVE acorns. I have sparkly acorns, felted acorns, glass acorns, and even a few acorn ornaments myself. I have a few pictures to share at the end of this post. But first, about today's project. I mixed some modern papers with some vintage ornaments. Hope you don't mind. I also played around with the colors. I actually have a couple of turquoise glass acorns with copper tops. They were the inspiration for these ornaments today. Unfortunately, I used them to decorate an event at our church, and they're packed away right now, so they weren't easily accessible to photograph. I just received some fun supplies the other day, and included was this mini-clipboard by Fancypants. It was the perfect size and I thought fit the style I was going for beautifully. The hardware was easily removed and added again once I decorated it with some charming Perfectly Plaid paper by Lawn Fawn. For the far right acorn, I tried a technique I found on Pinterest to give it an aged copper look. It's a tutorial by Copic in the Craftroom. I need some more practice, but I don't think it turned out too badly for my first time. I printed the sentiment on a piece of decorated paper, diecut it, and added it to the clipboard along with some enamel dots and ribbon. That was it. Today's project only took me 2 hours to color, design, and put together. That is quite a feat for me, let me tell you! Here are a few pictures of acorns that I have out on display right now. 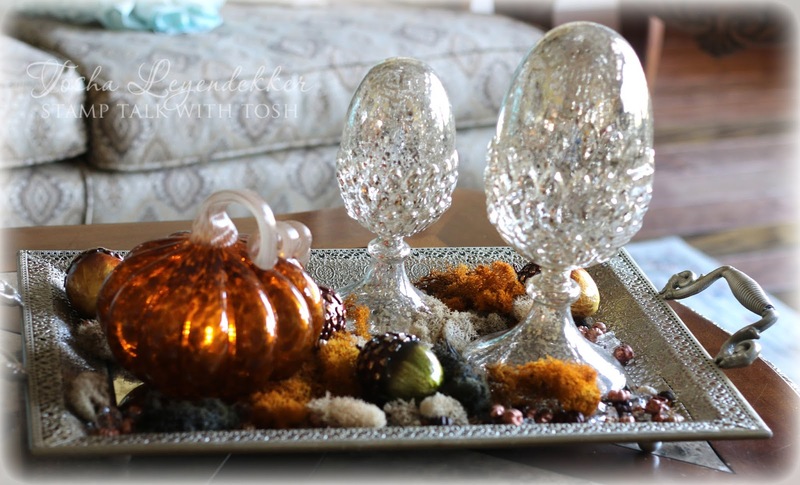 The two glass acorns below are displayed on a tray with a fun pumpkin that actually lights up. There are a few painted wooden acorns laying on the tray too. I love all things felted. 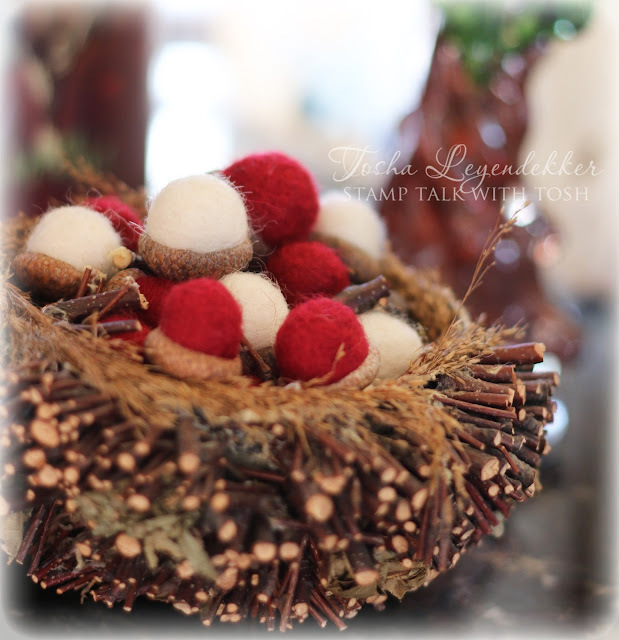 So, of course I needed some felted acorns right? These babies are on display in a fun twig nest. And lastly, this ornament is laying at the base of my vintage tree collage. I leave it up and decorated year round. This guy is just way too big for my 2 1/2 ft tree, so he's gracing the bottom along with a crown and some other vintage goodies. That's it for me today y'all. Be sure to stop by the Power Poppy Blog for a list of all the gals sharing their acorn projects today. I hope you are enjoying your weekend. Hello friends!! It's Friday!! 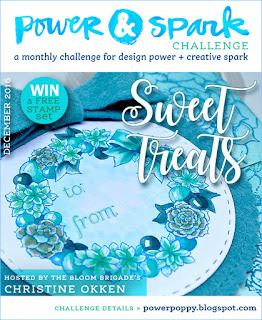 And, not only that, it's the first Friday of the month, so we have a new Power and Spark Challenge which I have the honor of hosting this month. Now, if you've followed my blog at all, you know that I love making cards with a vintage flair. Shoot, I like vintage so much I leave a small vintage decorated tree up year round. I can't make myself take it down. It just makes me happy to look at it. Anything goes, as long as you feature pink and Christmas. That's it. 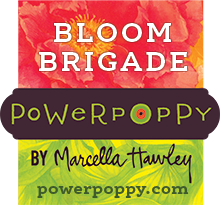 And if you participate, you could win some free Power Poppy stamps. What's not to love about that deal!!! 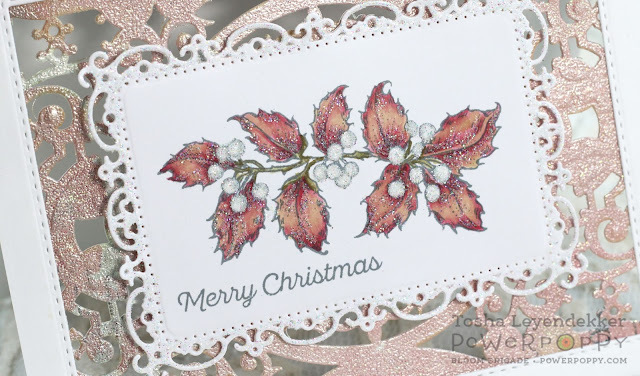 When I saw Marcy's new Holly Golightly this last release, I knew immediately that I wanted to color the leaves pink. I know it's not traditional, but I like to break minor rules on occasion. You know...the ones that make you feel like you're rebelling, but you won't get in trouble? I freak when I get in trouble, so this is as "bad" as I get. So, since we're going vintage, I had to add some sparkle. The background was made using a Tapestry diecut (Spellbinders), along with some gorgeous pink/white Prima Paper and Silver Pearl Embossing Powder by Wow! I just inked up the whole diecut piece with Versamark, poured the ep all over and heated that baby up. I LOVE the pink shimmery look I ended up with. It's also backless, so you can see through the die. The leaves were colored with Copics, (which I added E31 afterwards to, to vintage them up) and I added a touch of sparkle to them with a Quickie Glue Pen and some Dazzling Diamonds glitter (SU!). Once again, I used my Quickie Glue Pen on the berries, and covered them with some White Opaque Micro Fine Glitter (Glitter Ritz). Below is a close up so you can see the shimmer of the Silver Pearl ep, as well as a bit of the sparkle on the image. 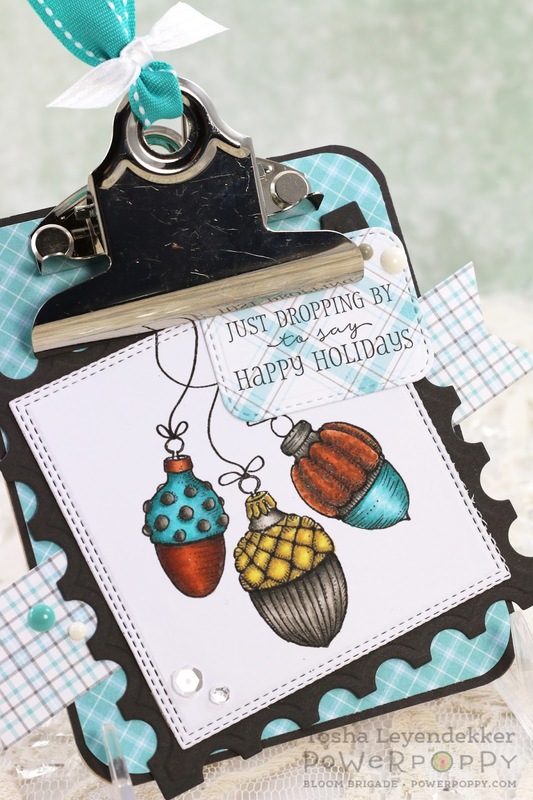 Oh...and I can't forget...I stamped the image with Gray Flannel Memento Ink to give it a softer vintage feel. That's it for my project. The following Bloom Brigaders have some more pink inspiration to share with y'all, so head on by to check out their blogs. Thank you so much for dropping by! I'm honored that you took the time!